Happy Tuesday (almost Wednesday)! In honor of Mr. Fo's birthday this past weekend, this post is going to be about beer. More precisely, a beer dinner. Over the summer, Mr. Fo landed a sweet gig and he is now working for the Boston Beer Company, which makes the deliciously delicious Sam Adams beer. For those of you that know him, this is his dream job times a million, so it was only appropriate to celebrate his day of birth accordingly. And side note, Sam Adams Oktoberfest rocks the house. 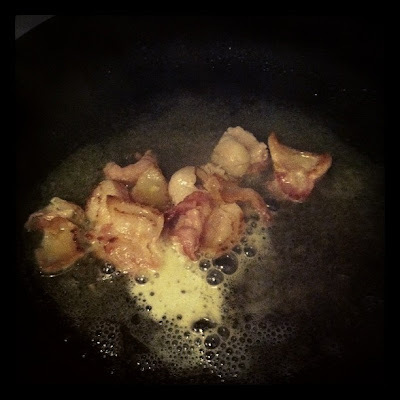 Preview pic - bacon soaking in beer. That's right.I hope you get the point that I'm not messing around here. Next up - clear crap off kitchen table. Unfortunately, couch eating at the coffee table whilst watching reruns of Law & Order: SVU (I miss you Stabler!) are not cool for birthday dinners. Or anniversary dinners. So basically, we eat at the table for birthdays, anniversaries, and when we're trying to impress guests. Which equals not that often. Programming Note: We might normally be couch/coffee table eaters, but I break out the wedding china and crystal candlesticks for special events. Honestly, if I don't do it then, they will never get used, and I adore my wedding china. I thank my Mom and Aunt for gently forcing me to put the china on my registry when I proclaimed "I'll never use it." I heart my wedding china and would take it to a dessert island. For reals. Thanks for making a beautiful pattern that will never go out of style and that I use 5-7 times/year. You're worth it, just like L'oreal. Enough rambling, more food talk. Got it. First up, I made a delicious cocktail using Angry Orchard Hard Cider, a Sam Adams product that is delectable. The Crisp Apple flavor tastes like apple picking, if apple picking had a taste. Blend Crisp Apple with a shot (or two) of Captain Morgan's Spiced Rum for an Angry Captain cocktail that tastes way more delicious than it does angry. I chose to make two carbs, because carbs make everything better. Plus, on your birthday you can eat as many carbs as possible without repercussion, it's a birthday fact. Samuel Adams Steak/Chicken/Pork Marinade which I highly recommend. Vegetables: Clearly we needed something green on the plate, yes? So i whipped up a good amount of sauteed spinach. Admittedly, I did cook bacon pieces in beer and add it to the spinach, but it's not like it takes away from the spinach's health advantages. Don't judge. It was his birthday. Here are pictures of our gourmet beer dinner, including a shot of the filet that I may or may not have seared the crap of on my cast iron pan. Some good information for those of you (like me) who lose track of time while cooking and leave cast iron pans on the stove for a bit too long- it's not possible to over-sear a filet, it was as delightful as could be. I don't know about you, but I can smell the Sam Adams through the computer. MMM...hops and barley. Next up - Dessert. Because we needed dessert, obviously. We hadn't had enough food. I'm sorry to say this was a) the one course that didn't have Sam Adams beer and b) this was store bought cake. This year I knew we were having carrot cake cupcakes the next night, PLUS, this meal was kind of intense. And I'm a busy lady. So when I was at Reid's picking up the filets, I saw these amazing cakes that Mr. Fo and I had taken home one time. They're multiple layer cakes in a chocolate flavor or a caramel flavor, made by a clearly talented woman in South Carolina. So when I say store bought, we're really saying that I'm supporting an independent, local baker. And if you've ever tried this cake, you would never bake anything on your own again. I may or may not have gotten one huge slice for EACH of us, which was really not a great idea, but we may or may not have each polished it off. We knew it was a bad idea, but we did it anyway. At this point, why hold back, right? Then we fell into a food coma. Whatevs. The next night we celebrated with great friends at VBGB, a fabulous beer hall in Charlotte with yummy food, a great patio, and tons of brews. 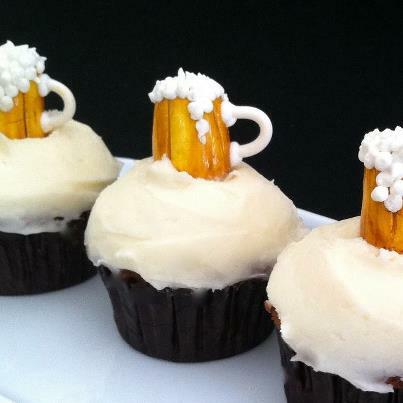 I brought these adorable cupcakes (made by another independent baker here in Charlotte) with Beer Mugs on top. They were excellent tasting and fantastic looking to boot! We totally sang Mr. Fo Happy Birthday and then we posed for a pic. Love this guy...don't you? If this post seemed slightly delirious it's because life's been a little crazy lately with work and events. I've got lots 'o events/weddings this fall, including a wedding I just booked that's in less than 2 weeks. For serious! But I'm always happy to help a bride in need! I hope your week is going great so far! what a great idea! Everything sounded so delicious! p.s. love the china!